Off of the north road, close to the Sound beach in Riverhead is a hidden oasis that is called Northville Sensory Gardens and affectionately known as ‘The Farm.’ In April and May, everything happens. The gardens come back to life, but not without the help of Ken Friberg and his crew, comprised of two part-time year round staff, BOCES students, and individuals from RISE Life Services’ residences. In this park, you will find four ponds that connect, starting out as a waterfall to a stream and to the ponds, and then re-circulate back into the waterfall system again. There are paved paths for strolling as well as picnic areas, a gazebo and serene natural beauty. 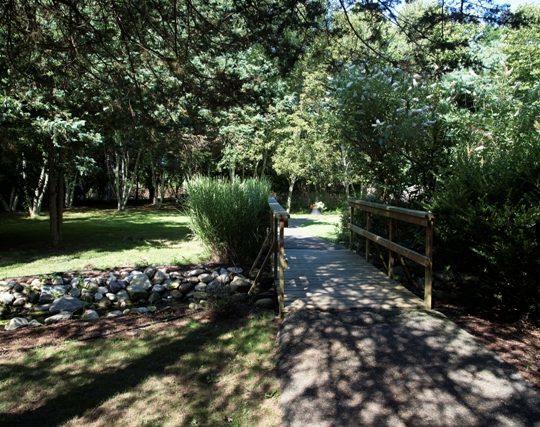 The Northville Sensory Gardens are also the home to sheep, goats, chickens, ducks, a miniature horse and a Newfoundland dog for extra therapy. From the last week of April into early May, the staff will work on draining the ponds, netting the fish, cleaning the ponds completely and refilling them, returning the fish back to their pond homes. Equipped with their hip boots while they shovel out leaves that fell last fall, it’s a big project with a breathtaking result. They will also monitor planted seeds in the greenhouse through this early part of the growing season. It provides a controlled, even temperature for the important vegetables and gourds. Individuals from RISE work at the Gardens in shifts, a morning group and an afternoon group two days per week. They work and receive a paycheck for their time. They perform different tasks, such as working with the farm animals: cleaning, feeding and moving them. They will also care for the plants and bushes: pruning, raking and bedding the flowers. The BOCES students come three days per week for a few hours with their instructors in groups and work on similar tasks: raking, cleaning, composting, as well as grooming and caring for the animals. Each member of the team has an important job to do, whether they are year round or seasonal staff. Maintenance is continuous and constant during all four seasons in order to keep Northville Sensory Gardens running smoothly and safely. To learn more about this location or how to donate to this specific site, please click here.